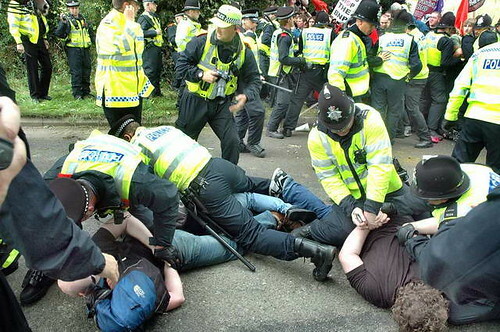 Two photographers, Jonathan Warren & Marc Vallée were assaulted OUTSIDE the climate camp yesterday. It is disgraceful and as much the fault of the climate camps misguided policy on journalism, as it is of the folks that attacked them. 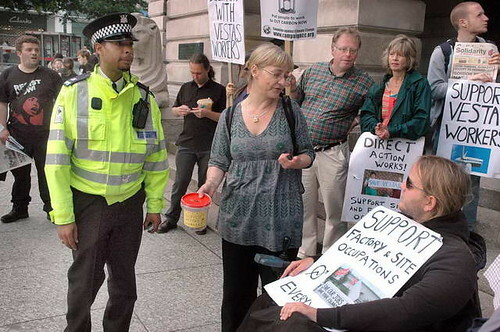 It was outside the Euston Station in 1999, during the WTO protests, that I was severely beaten up and lost most of my teeth and a jaw fracture. What was even worse for me is that these bastards ‘looked like’ so many of my own kind, and wore little anarchy badges. This also resulted from an unreasonable attitude by some campaigns to photography. When I got home, there were 14 messages on my answerphone, asking for my pictures to help with police complains and asking for defence in court!!!!! This will never change while some people think that they can moderate what gets published by intimidation and violence. Just like the heavies, police and governments do in their ‘media management’. Bastards!! We realise that these few people and one incident are not representative of the camp as we have covered the movement for some years now. However, we believe that the camp’s policy towards photographers and the media have created an environment that sets the stage for this behaviour to happen. The atmosphere created by your policies and attitude towards photographers worryingly parallels the anti-terror laws and attitude that we find the police using against photographers. The Agitator2 from Joe Morris on Vimeo. We’re continually being told the Internet empowers the individual. But speaking as an individual creative worker myself, I’d argue that all this Utopian revolution has achieved so far in my sector is to disempower individuals, strengthen the hand of multinational businesses, and decrease the pool of information available to audiences. All things that the technology utopians say they wanted to avoid. I’m a freelance professional photographer, and in recent years, the internet ‘economy’ has devastated my sector. It’s now difficult to make a viable living due to widespread copyright theft from newspapers, media groups, individuals and a glut of images freely or cheaply available on the Web. These have combined to crash the unit cost of images across the board, regardless of category or intrinsic worth. For example, the introduction of Royalty Free ‘microstock’, which means you can now buy an image for $1.00, is just one factor that has dragged down professional fees. I already hear you telling me to stop crying into my beer as the world doesn’t owe me a living, and that expanding imagery on the Web has democratised the medium. I’d partially agree with both arguments, as in my work of newspaper and magazine photojournalism you’re only as good as your last picture, and photojournalism in recent years has become infected with an unhealthy sense of elitism and entitlement which could do with a good kick up the arse. So what’s the problem? Well, lets look at one trend which would appear to suggest more “democracy” in the media – but actually doesn’t – and that’s ‘User Contributed Content’, or ‘Citizen Journalism’. 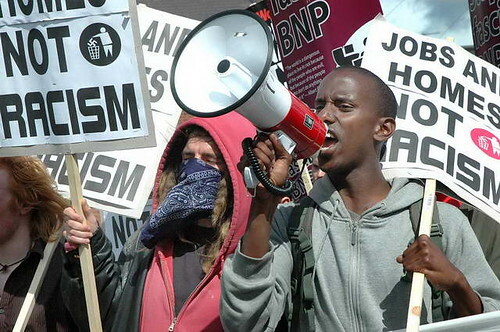 The mainstream media has propagandized hard for Citizen Journalism ever since the mobile phone images of the July 7th London bombings, but sadly, this enthusiasm has little to do with journalism or democratising the media.. User Contributed Content should be more accurately termed ‘Audience Stolen Content’, because media groups rarely pay for Citizen Journalism images and more often than not, either claim the copyright or an all-encompassing license from contributors, when they send their pictures in. That’s a copyright grab in all but name. 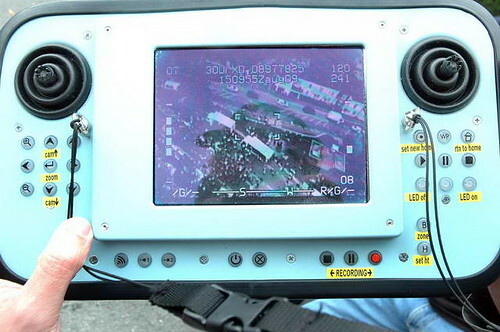 ‘AirRobot’ were showing off their AR100B surveillance drone at the anti-BNP protests in Codnor, Derbyshire. 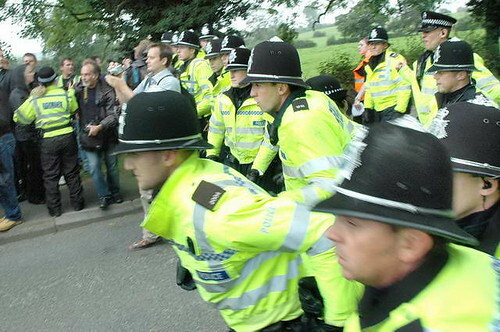 It was also flow over the lane at the second ‘designated protest point’ in Codnor Denby Lane. I didn’t see it, but I guess they also used the device over the festival field itself. 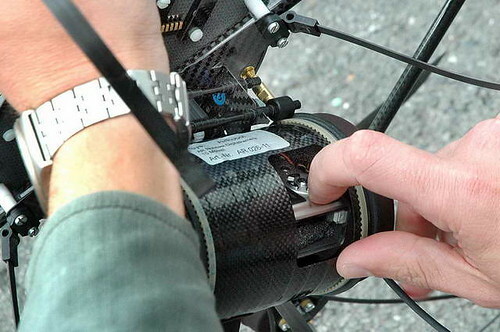 Pilot Mark Lawrence was from the German company, AirRobot. 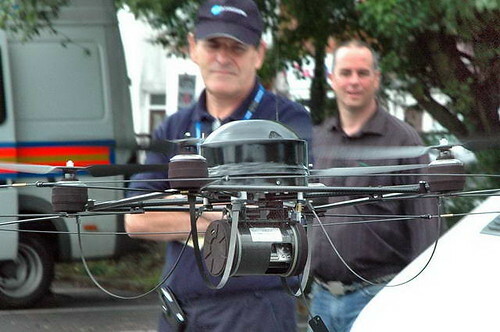 He was demonstrating the surveillance drone capabilities to members of the Derbyshire Police Operational Support Unit. The police haven’t bought it yet but they said that they may share the £25,000 costs with Nottinghamshire Police, same as with the helicopter. I said that I was aware of a number of different manufactures of this sort of equipment, so, what about those? The police rep said that optically, and endurance wise, they are all quite similar. This device however was a much more stable platform. For example a gust of wind could unbalance the craft before an operator could correct it. But some of the trim capabilities were automatic. Thus, the operator can pay more attention to the subject, and less to the flying of the device. It has about 30 mins battery life endurance, a max height of 1000m although I think it would usually be operated a lot lower. Horizontally, between 500 – 1000m because of the range of both the control signals and the informantion downlink. Like International Rescue Thunderbird 2, it can be fitted with a number of differant cameras. They come in modules. It seem to me this is a neat way of saving weight in that exactly the right camera for the mission that moment can be fitted. It takes only a couple of minutes to change the camera module if required. The image on the control deck was of ‘monitor quality’. Enough to fly it and see where it’s pointing. High quality images can both / either be stored on a card or transmitted as downlink to the gold commander operations room. This was the same bit of kit that was deployed over Stonehenge during the Summer Solstice in June, this year. All in all a nifty bit of kit. I want one! 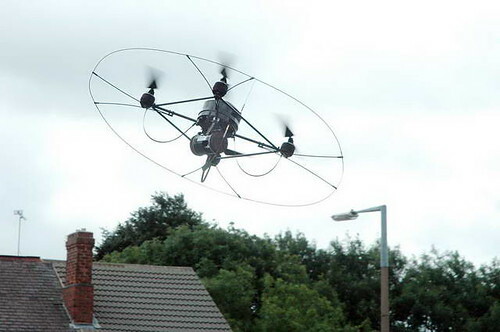 Video: AirRobot RotorCams, showing off the latest advance in aerial surveillance, the AirRobot. About 2000 folks demonstrated against this event. Police had been granted orders under the Public Odger Act 1986. 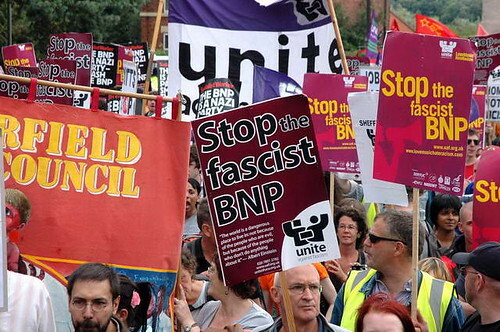 This defined the march route, and created 2 “Designated Protest Points” in Codnor Market Place and on Codnor-Denby Lane, 250 metres short of the entrance to the RWB events. Some made and effort to push past the police cordon there. This was reinforced a number of times, eventually deploying horses and dogs. A few arrests resulted, but no serious injury. A total of 19 people were arrested at various locations. Three have been charged with public order offences and a fourth with unlawfully obstructing the highway. 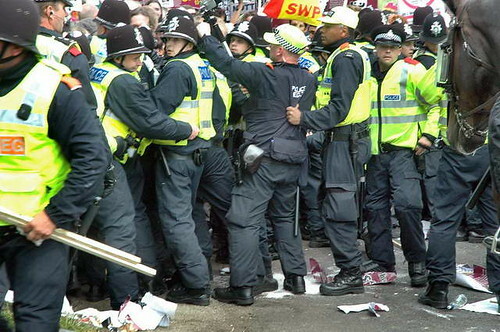 The police operation cost around £500,000 and involved more than 500 officers, many from other forces, on the mutual aid scheme. Take a look at this. The video is from last night when 500 activist tried to stop the eviction and deportation of 19 Iraqis. http://sondagsavisen.dk/91/050125136 could take an award i think!!!! I am told it went on like that for more than an hour! I’ve never seen so fierce application to so clearly applied to non-violent protesting people. 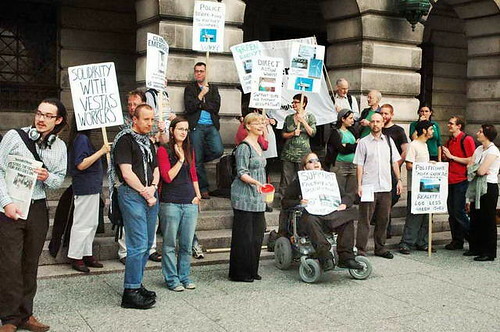 On Wednesday 12th August at 5:15pm, supporters of those in dispute at Vestas, met by the Left Lion in Nottingham’s Market Square. As the workers continue to suffer the fallout of a recession not of their making and as the unsustainable ecological destruction of the planet continues apace, supporters applaud those who are willing to resist the swinging cuts that we are all expected to accept. 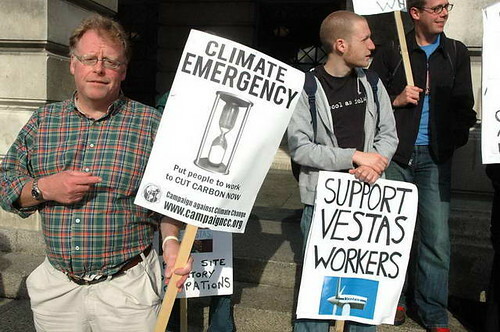 The Vestas worker’s may have been evicted from their factory occupation. However, the fight to keep the factories open, to save jobs, to win a better redundancy deal and the needs to highlight the massive damage to the planet we continue to cause. 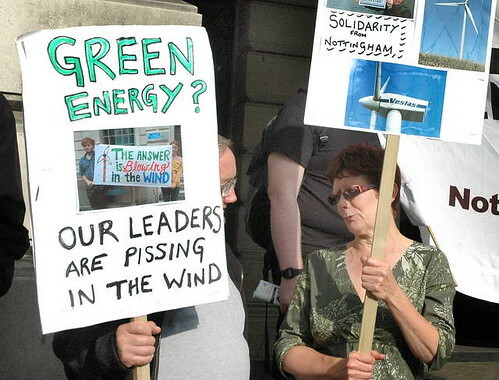 Many joined the Market Square as part of a Nottinghams contribution to the nationwide show of solidarity with the Support Vestas Workers’ day of Action. 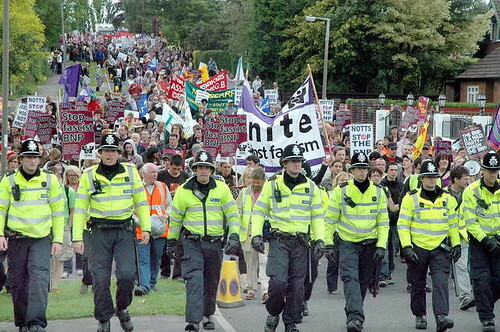 Some of Nottingham’s activists are currently on the Isle of Wight.